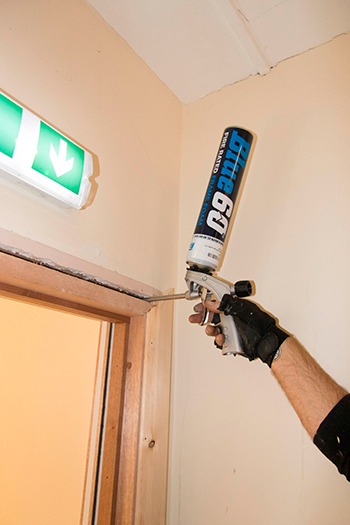 Do you have to replace fire door frames when upgrading doors to fire doors? Is it okay to hang a new fire door in an existing frame or should frames be replaced at the same time? Are there any checks that can be done to make sure the door frame is suitable for a fire door? These are very important questions frequently overlooked when replacing doors with fire doors. In this article we will therefore consider timber door frames for fire resisting doors and cover their requirements over and above those of normal door frames. What is a fire door frame? 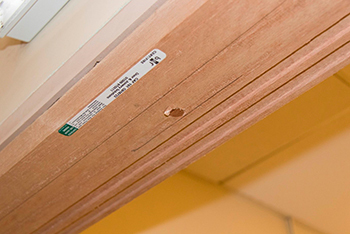 A fire door frame is one of several components that make up a fire door. Other essential components are the door leaf, hinges and intumescent fire seals. Depending on the fire door's intended use a self-closing device, lock, latch, smoke seals, signage and door furniture may also be essential. The performance of a fire door is dependent on the performance of all of the components working together. Therefore it is not possible to achieve fire performance just by fitting one fire rated component in isolation. A fire door leaf fitted in an unsuitable door frame is not a fire door, as an existing door frame may not have been intended or designed to provide any fire separation performance at all. Nowadays it is easy to purchase certificated fire door frames and these will carry a label to identify the applicable fire rating. However, the disadvantage of replacing an existing frame with a new fire door frame is, of course, that removal of the old frame may cause damage to the surrounding wall and will therefore incur extra work and costs. Retaining an existing door frame. When making a decision whether to retain or replace fire door frame the first issue is to consider the legal position. If the door in question is not contained inside a private dwelling then fire safety law will apply and the employer, building operator, owner or his agent has a legal duty under Article 17 of the Regulatory Reform (Fire Safety) Order 2005 to ensure that the fire door is 'subject to a suitable system of maintenance and maintained in an efficient state, in efficient working order and in good repair'. This means the 'Responsible Person' under the Order has a duty to ensure that the door will provide sufficient protection to contain the fire so as to ensure the safety of persons in or around the building in the event of a fire. The second issue may arise if the works being undertaken are subject to building regulations. In England and Wales Approved Document B of the building regulations covers fire safety and refers to fire doors having evidence of performance to BS476-22 and BS EN 1634-1. The building inspector may insist on confirmation that the fire door has evidence of performance to those standards. No amount of work or effort will turn an existing door frame into a certificated one. Manufacturers of certificated fire door frames, on the other hand, will belong to a certification scheme and had their products tested or assessed to provide fire performance. However, if it is important that an existing (non-fire) door frame is retained, it is wise to engage the services of an expert to inspect the door frame and he may be able to confirm its suitability. The inspector will compare the door frame against the specification requirement for the actual fire door that is proposed as well as making reference to BS 8214:2016-'Timber-based fire door assemblies Code of practice with regard to product suitability and installation methods'. Such an expert should be an experienced assessor of the fire performance of building products. Based on his experience of the behaviour of timber doors and frames in fire performance tests and associated calculations he may be able provide a written assessment. The cost for such expert advice is likely to exceed that associated with replacing the door frame and is therefore only practical where a large number of doors are considered or perhaps in a heritage building. What is a suitable fire door frame? We have established above that it is the preferred option to purchase a new certificated door frame. However, if you are trying to retain a door frame what evidence might be available to justify using the existing frame? Nowadays all fire door leaves placed on the market must have evidence of performance. The door manufacturer will be able to provide evidence in the form of certification and product data sheets or written assessments of fire performance and installation instructions. These documents provide details of the required door frame specification and will enable a suitably competent person to compare the door frame intended for use with that specification. These details include the minimum sectional dimensions for the frame, the density of the framing material, the specification for intumescent fire seals, the size, type and number of frame fixings, the type of wall construction and the installation methods including sealing between the frame and its supporting wall. Further considerations will be the condition of the door frame and the fire rating of the door. Any damage, gaps at joints, missing hardware or misalignment between frame and wall or frame and door leaf may render the door frame unsuitable. Specifications in terms of size and quality of materials will vary between thirty minutes fire doors (FD30) and sixty minutes fire doors (FD60). Generally, softwood is suitable for FD30 door frames whereas hardwood will be required for FD60. However, density of material is a critical factor to fire performance and certain hardwoods may not be suitable because they are known to exhibit unpredictable behaviour in a fire. Installing a fire door is a job for a competent installer and not all carpenters or joiners will be sufficiently aware about installation specifications particular to fire doors. Where existing door frames are retained the installation work will always be more challenging because the door leaf will have to be sized to suit the frame that's already there. This will mean more time is spent planing-in edges and making sure perimeter gaps are correct at between 2mm and 4mm at the top edge and all vertical edges (fitting a threshold plate to the floor will make it easier to achieve the correct threshold gap, which is a maximum of 10mm). Where double doors are required this job will be even more onerous. Very important: Fire doors have maximum allowances for trimming at the edges, trimming should also be equal on the vertical edges and a minimum thickness for the hardwood lipping around the edges must be maintained. Sometimes it will be necessary to order a bespoke door leaf made to specifically suit the door frame because standard sizes would necessitate trimming over and above the allowances. Trimming a fire door outside the limits contained in the installation instructions will void any performance certification and a door that is incorrectly aligned in its frame will fail prematurely in a fire. Also, fire doors must have intumescent fire seals and most likely cold smoke seals, too, so it might be necessary to machine a groove into the edges of the door leaf for fitting of the seals. Surface mounted fire door seals are also available. Some fire doors are available with intumescent seals concealed behind the lippings but an exposed one will still be required at the top edge and most likely smoke seals will be needed, too. It can clearly be seen that using an existing fire door frame rather than fitting a new one is, in the majority of cases, likely to be more troublesome. There will be doubts about suitability, no evidence of fire performance is available and expert help may be needed but even when these issues are overcome the actual installation work is likely to be more difficult and time consuming. We would therefore recommend to purchase a fire door together with matching fire door frames, which have been tested as a fire door set in fire tests. Safelincs offers a simple fire door configurator that allows you to select the required type of fire door with frame. These sets guarantee, as long as they are installed correctly, performance and the correct dimensions required.